I'm back! After a busy summer of unexpected travels, to new places, and new food discoveries, I'm looking forward to re-connecting with you and sharing how herbs and spices can enhanced your everyday meals. Also, welcome to September - the perfect national month for life's comfort foods like Chicken, Potato, and Rice. Since many of you are harvesting your garden produce as I send out this newsletter, I decided to reprise an earlier one that helped you with canning (preserving foods in bottles and jars), and pickling the fruits of your labor. Although the "canning and pickling season" is conducted throughout the year depending on where in the world you’re located, for you it is whenever you’re doing a lot of harvesting of your garden (typically from early to late summer and early fall). Just depends on what is plentiful in your garden or available at local produce markets. 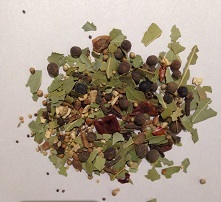 Pickling spices recipes are blended for one of the oldest methods used to preserve foods: Pickling. Pickled food is brined or fermented. Most people think of cucumbers harvested to make dill pickles; however, other fruits (e.g., grapes), vegetables (e.g., tomatoes, beets), and foods (e.g., eggs) are pickled too. Pickling spices can include: cinnamon sticks, mustard seeds, bay leaves, allspice berries, dill seeds, whole cloves, gingerroot, black and white peppercorns, coriander seeds, juniper berries, mace blade, star anise, cardamom seeds, and hot chili peppers. Chicken, Potato, Rice, Papaya, Honey, and Mushroom. It is National Cholesterol Education Month too.